Simply Pam: Happy Valentines Day Dad! I made this card for my Dad. He was a Vietnam vet and has 3 Purple Hearts. When I was trying to come up with a card my aunt said 'Hello, purple heart/heart valentine'. So she gave me the idea and I ran with it. The purple on the Purple Heart is in fact purple. For some reason it is showing up blue in my photograph. For the embossed background I used the Cuttlebug Script embossing folder and then used the Tim Holtz Tea Dye ink on it. 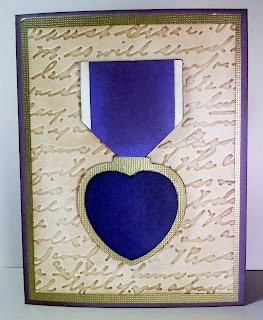 The Purple Heart was cut from the Stand and Salute cartridge. He is a lucky daddy! It does look much better in real life. You are so talented.